Owner of successful local confectionery firm Golden Casket, Mr Rae was born on 14 June 1931 and was the recipient of an Order of the British Empire (OBE) in the Queen’s birthday honours list in 2016. Mr Rae stepped in to prevent administrators from putting Greenock Morton into liquidation in August 2001 and went on to serve as chairman for 17 years. Riverside Inverclyde (Ri) is aiming to revitalise West Blackhall Street and promote further investment and improvements in Greenock Town Centre. The consultation will take place on Thursday 28th June 2018 from 12.00-5.30pm in the Oak Mall Shopping Centre in Greenock. RCH has bolstered its development programme with an £127m funding package. Under the new arrangements, facilities have been refinanced and increased from £65m to just under £127m (new loan facilities of £100m and £27m from Royal Bank of Scotland and Nationwide respectively). At Monday's Smart Shipping Symposium hosted by the City of Glasgow College Faculty of Nautical Studies, Jim McColl OBE, Chairman and Chief Executive of Clyde Blowers Capital announced that Port Glasgow-based and Riverside Inverclyde tenant, Ferguson Marine Engineering Limited, has successfully led a European consortium in a bid for EU funding support to pave the way for the building and launch of the world’s first sea-going car and passenger ferry fuelled by Hydrogen. An Inverclyde Council primary school has moved back into its newly refurbished home that has undergone a £5 million transformation. Moorfoot Primary in Gourock is the latest project to be completed in a £270 million school estate investment programme. A £1.1 million deal has been sealed for the purchase of a vacant commercial unit in Inverclyde by Sandy and James Easdale. The vacant 86,000 square feet building in Greenock was previously owned by computer reseller Misco UK until company fell into administration last year. Inverclyde will get £21 million in total over the next five years to expand early years learning and childcare. Every three and four year in Inverclyde will be entitled to double the number of hours at nursery by 2020. There are still no plans for a replacement HMP Greenock - despite warnings that the current Gateside jail is falling apart. Scotland's top prisons inspector, David Strang, revealed in his recent report into conditions at the 108-year-old building that 17 cells have been condemned due to serious water ingress and dampness. The installation of a new state of the art Wi-Fi system is underway at Kip Marina as part of an initial £30,000 investment to deliver high capacity Wi-Fi to all our berth holders and across the full marina site, offering secure internet access and delivering a digital connectivity whether on a boat, in Marina Reception or The Chartroom Restaurant. Taste Inverclyde was delighted to partner with Cannongate and The Times Scotland to deliver an advertising presence at the Royal Highland Show in Edinburgh from 21-24 June 2018. Inverclyde Council’s programme to deliver double the number of nursery hours by 2020 has the potential to help close attainment and inequality gaps. The expansion of early years learning and childcare will be achieved with three new Council nurseries and five refurbished facilities. Riverside Inverclyde (ri) and Craig Black Design hosted its inaugural Creative Inverclyde event on Wednesday 13 June to over 60 creative attendees. Hosted at The Custom House in Greenock, the event has been hailed as a fantastic success by the delegates and speakers. A former Morton player is now one of the most in-demand graphic designers in the world. Craig Black, of Gourock, has gone on a remarkable journey from the football pitch to the art studio. Business is heating up nicely for a Greenock company which has just been named as one of the best in the country in its field. The three-strong team at Protec Plumbing and Heating are basking in success after being named as runner-up in the Scottish Home Improvement Awards. Line of Duty actor Martin Compston has arranged for singer-songwriter Example to headline a concert in Greenock. The show takes place on this week, on June 28th in Greenock Town Hall with proceeds going to Ardgowan Hospice. Not only is Example playing a full set, he is followed by special guest George Bowie, bringing his now legendary George Bowie Experience to the town. Inverclyde Council has rubber-stamped a £100,000 refurbishment of the area’s indoor bowling club. The council's education and communities committee approved plans to replace the bowling carpet and install new lighting at the venue in Port Glasgow Road. Reach for the Stars - the Inverclyde Community Awards 2018 - is now open for entries, to recognise and reward the achievements of volunteers and voluntary organisations across the district. A card shop is the latest retailer attracted to Port Glasgow's shopping park. Card Factory have applied for permission for a £30,000 refit of premises at the retail park. James Watt Dock Marina in Greenock is hosting two superyachts - Archimedes, and MY Monaco. Work on a £400,000 Inverclyde Council scheme to tackle drainage issues at Birkmyre Park in Kilmacolm is set to begin. Both rugby pitches will have drainage pipes installed under the surface, carrying excess water to the nearest water course, the Gryfe Water. Software Training Scotland (STS) has announced a further expansion at Scarlow House Business Centre in Port Glasgow. The company - which initially moved into Scarlow House in March 2018 - has enjoyed a further period of growth and interest in its wide range of training courses. As a result, STS has more than doubled the space let from regeneration company Riverside Inverclyde (ri) to 495 square feet. A Greenock man has been crowned Young Seafood Chef of the year. Jamie Cracknell and his partner Sagar Massey battled it out against eight other teams to produce a three-course meal using sustainably sourced seafood at a national competition hosted by the Grimsby Institute. The Positive Goals employability programme run by Morton in the Community and backed by River Clyde Homes is returning for a second year. The 2017 programme was a great success, with 61% of participants that completed the six week project gaining work or a place in full time education, and of those, 81% sustaining this destination for a minimum of 13 weeks later. Greenock Morton Football Club is pleased to confirm it will host English Premier League side Cardiff City in a pre-season friendly fixture at Cappielow on Tuesday 31 July, with a 7.45pm kick-off. Bus company McGill’s treated children from St Joseph’s Primary School to an open-top bus tour of Inverclyde. The pupils got to experience the one-hour trip which McGill's offer to cruise ship passengers. 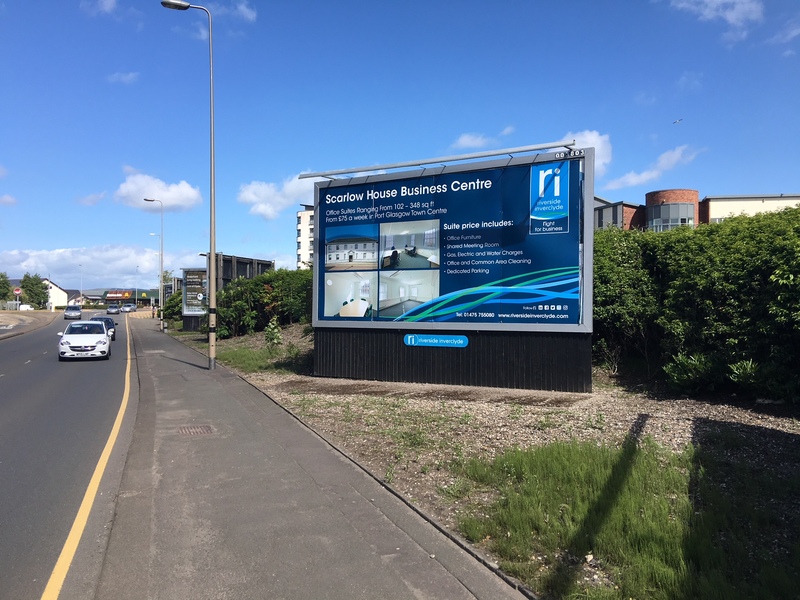 Riverside Inverclyde (ri) is delighted to confirm that the six advertising hoardings on Main Street in Greenock have been snapped up by Inverclyde businesses for the rest of 2018. The advertising - which were made available for local businesses to use in August 2017 in line with ri's strategy to help business growth - have proven to be a popular space for companies to advertise. A group from Greenock and District Scouts got a pleasant surprise during a tour of the local Amazon fulfilment centre - they were presented with a gift of £1,000. The team at Amazon Gourock had invited young members and their leaders for a behind-the-scenes look at the local fulfilment centre.